Schmitt is an elite-level coach with 15 years of Division I collegiate coaching experience at the highest levels along with 5 years of club coaching. 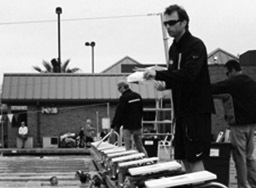 Prior to joining Sierra Marlins Swim Team Schmitt was an assistant at Auburn University and was the associate Head Coach at Arizona State University in which the team was consistently in the top ten at the NCAA meet, and was the Head Coach at his alma mater Louisiana State University where he resurrected the program to a top twenty status nationally. Having coached over 100 All-Americans, multiple SEC and PAC-10 champions, and NCAA individual and team champions, he was recognized as one of the elite coaches in America by being awarded the American Swim Coaches Association Excellence award for 4 consecutive years. He specifically coaches the Senior/National group but oversees the coaching of the Marlins. Fun fact: Coach Adam is also a black belt in Tae Kwon Do.